Everybody's special, right? Isn't that what your Mom always told you? Finding out what makes you special, though, isn't always easy. I'm proud to say that I finally figured it out. Today is my birthday, June 22. (Thanks for the card!) 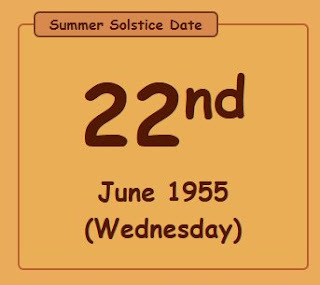 As a kid I always equated my birthday with the first day of summer, otherwise known as the summer solstice. Whenever I mentioned this to other people, though, I was almost always told, "No way kid, the summer solstice is on June 21st", and that would be the end of that. I didn't care enough to dig into it further. A couple of days ago, though, I read that this year's summer solstice (in the northern hemisphere) was on June 20th. That was two days ago! How could I have been that wrong as a kid? There's no way I was off by two full days. It was time to go down the Internet rat-hole and investigate. It was a quick investigation. My first stop was, of course, Wikipedia, which authoritatively stated that, "depending on the shift of the calendar, the summer solstice occurs some time between June 20 and June 22 in the northern hemisphere". It also displayed the table shown on the right which provided the dates of the summer solstice between 2010 and 2020. If you click on that graphic, though, you'll notice that June 22 does not appear anywhere. What gives? 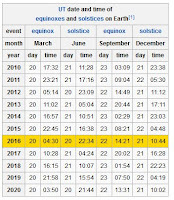 At this point, Wikipedia does a fairly poor job of explaining, citing simply the "leap shifting in the Gregorian Calendar" as the cause. In a nutshell this refers to the fact that the Gregorian Calendar is slightly out of sync with the Astronomical Calendar, requiring corrective measures like leap-days and leap-seconds. There's undoubtedly a much more academic discussion of this phenomenon somewhere on the web but I'm not interested in searching for it and you sure as hell aren't interested in reading it. But here is something that is interesting and what makes me so special. 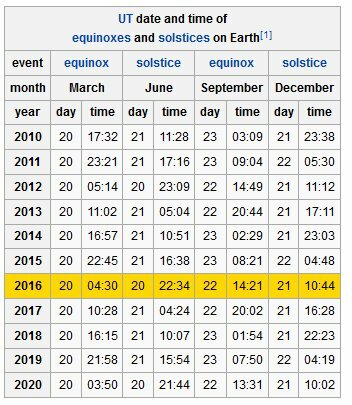 This website contains a table showing the exact date of the summer solstice in the northern hemisphere from the years 1600 to 2400. In that 800 year span, it occurs on June 22 exactly 87 times. And -- you guessed it -- one of those times was in 1955, the year I was born. Yes!! I win the game!! I was born on the summer solstice!!! One other thing. 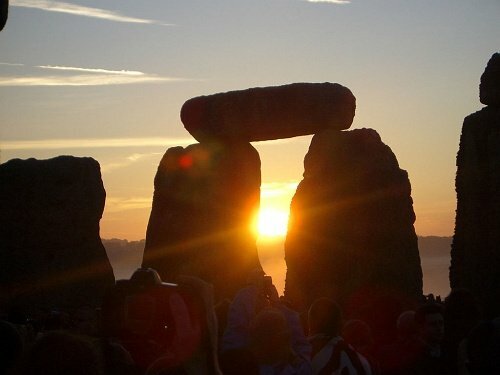 Since my birth, the summer solstice has occurred on June 22 only five times, the most recent being in 1975. Amazingly, it won't happen again until the year 2203! So from a slightly skewed viewpoint, I'm not 61 today. From a Gregorian/Astronomical Congruence viewpoint, I'm only 5, and I won't be 6 for a very, very long time. Naturally, birthday cards and presents will be graciously accepted on a Gregorian basis.